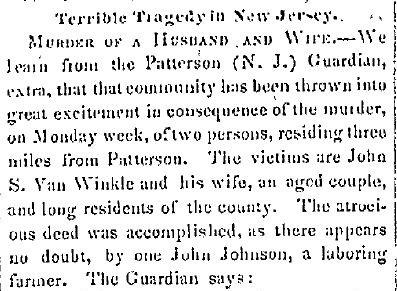 The murderer, some two or three years since worked for his victim as a farmer, and who at the time was employed by some of his neighbors in the same capacity. 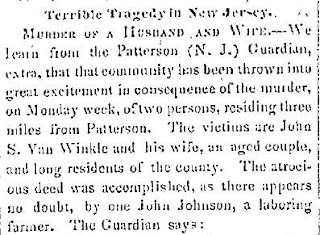 It would seem that Johnson effected an entrance into the house though an upper window by means of a ladder, and descending to the bed room of his victims below, accomplishing his murderous purpose by first attacking the wife, who slept in front , the husband, and again the wife. The second attack appears to have immediately deprived the wife of life; the husband is still living, but his death is momentarily expected by attending physicians, such is the extent of his wound. The chief instrument used appears to have been a knife, though the husband bears marks of a hatchet. Each received several stabs in different parts of the body, including the abdomen, and the sight which the bodies presented when discovered was a most harrowing one, the bowels of the husband especially, protruding and lying by his side. The floor and bed were saturated with blood as may be supposed from the nature and number of the wounds. A boy only slept in the same dwelling. Aroused by the noise in the room below, and ascertaining on descending and softly opening the door, the butchery going on within silently left the house and alarmed the neighbors, but the bloody murderer made his escape before they arrived. The fresh snow, however, enabled his pursuers to track him, who soon succeeded in finding and arresting him. He had in his possession some of the clothes of Mr. V. W., and bore about him unmistakable marks of guilt. He is now in our jail. His object was doubtless money, (which however, he seems not to have obtained.) as Mr. V. W. is known to possess great wealth, probably amounting to $100,000, though a plain and unostentatious farmer. It is gratifying that the inhuman wretch has been arrested, but the punishment which is sure to await him cannot atone for the deed itself. It cannot restore the harmless wife to life, nor save the husband from a speedy death. It is proper to say that Johnson has borne a good character when sober, but when drunk he is little better than a madman as we are informed by those who have long known him. Wow! How different are our newspaper articles today! My favorite lines from this piece is: "He had in his possession some of the clothes of Mr. V. W., and bore about him unmistakable marks of guilt." And also the graphic detail of the scene is something we definitely wouldn't read today. And they didn't even pretend to be objective: "It is gratifying that the inhuman wretch has been arrested, but the punishment which is sure to await him cannot atone for the deed itself."